Phalaphala FM Live Online from Johannesburg, South Africa . 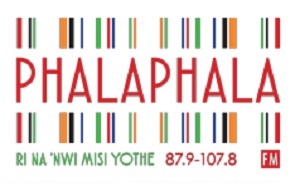 Phalaphala fm was born on the 2nd of February 1965 and came into being after a merger between Radio Venda and Radio Thohoyandou . This is a South African radio station operating through SABC, South Africa's government owned national broadcaster. It broadcast in the Tshivenda language and can be received mainly in Gauteng and Limpopo provinces. Physical Address : SABC Limpopo , 19 Hospital , Polokwane . Postal Address: P.O. Box 985 , polokwane , 0066 .